This month is part three of a six part series about life and work after age sixty. This series is for those who want to create a thoughtfully crafted future that is best described as a portfolio life. The five elements of a portfolio life include 1) working in the form you want, 2) learning and self-development, 3) giving back, 4) healthy living, and 5) enjoying personal pursuits and leisure. In this month’s blog I will be describing the second element of a portfolio life, learning and self-development. Along with offering numerous learning and self-development options after age 60, I will provide a link to a March 15th article from the Minneapolis Star Tribune newspaper about a 67 year old student’s return to the University of Minnesota. I will also share a friend’s story about the many benefits of participating in the Osher Lifelong Learning Institute (OLLI) program. This month’s blog title “Curiosity Never Retires” comes from that adult learning program. In our 60s, many of the learning and self-development elements of a portfolio life might still have a professional focus. Most of us are familiar with the resources available to help us stay current in our professional life. Staying current and connected in our field is usually a good idea, especially if we hope to stay professionally engaged and employable after age 60. When the time is right, however, you may prefer to do and learn things altogether different from what has been your professional focus. Consider these programs and resources: universities, the Osher Lifelong Learning Institute (OLLI), online learning, podcasts, CDs, books, TED talks, the One Day University, community education, physical, personal, spiritual and financial education, and development resources. Don’t forget libraries, and take a look at one of my personal travel + learning favorites, Road Scholar. Google any of the above, and discover what is available in your community, on line, and beyond. In the Twin Cities consider lifelong learning options at The University of Minnesota and other local colleges, Learning Life at the U of M, and the Selim Center at the University of St. Thomas. Education is often free or deeply discounted for seniors 62 and older when attending college level classes. One day, when your professional world narrows and the rest of your life broadens, why not think of yourself as a liberal arts college freshman, but without the need for a professionally focused major or course load? This month in the Minneapolis Star Tribune newspaper you’ll find an excellent article describing how one 67 year old, and more than 500 retirees, are taking classes at the University of Minnesota, but not to earn a degree. They are attending the University’s Senior Citizen Education Program. Click here to read that article, and give some thought to a university class that could be a great experiment for you. Two years ago I facilitated an eight month class at my church entitled, “Will a Portfolio Life Become Your Second Half Story?” There were eleven participants in this class, with an average age in the mid-60s. One class member totally lit up when describing her learning and self-development experiences in recent years. Here is her story. Janet had a liberal arts undergraduate degree, with two master’s degrees. Her career incorporated work in public transportation, public health, teaching, and raising two children. Janet was a frequent volunteer in schools, church, politics, and her community. She retired in 2014 after over 20 years in public health. Was inexpensive – one registration of approximately $250 covered multiple courses for 26 weeks of the year. Had wide ranging programs including art, history, science, sociology, travel, music, literature, theater, and so much more. Was convenient, with most classes during mid-day hours and at various locations throughout Twin Cities area. Offered an opportunity to meet other interesting class participants with similar interests. Janet also discovered many other learning options in the Twin Cities area, such as book groups at libraries, other library discussion groups on various topics – history, current events, etc., Westminster town forums, community education catalogs from school districts, and community activity listings from municipalities. Janet has starting painting and knitting since retirement, something she hadn’t anticipated. “These learning opportunities are easy to find, easy to try, and easy to discontinue if they don’t fit for some reason. I hope the combination of the learning and self-development resource listings, Star Tribune article, and Janet’s story will motivate and guide you to craft new experiments. I also encourage you to shift some of your personal connections to people like Janet who will guide and embolden you, as she did each of us in the church class I referenced. Enjoy the road ahead. Keep broadening and deepening your knowledge and your life, and never let your curiosity retire. 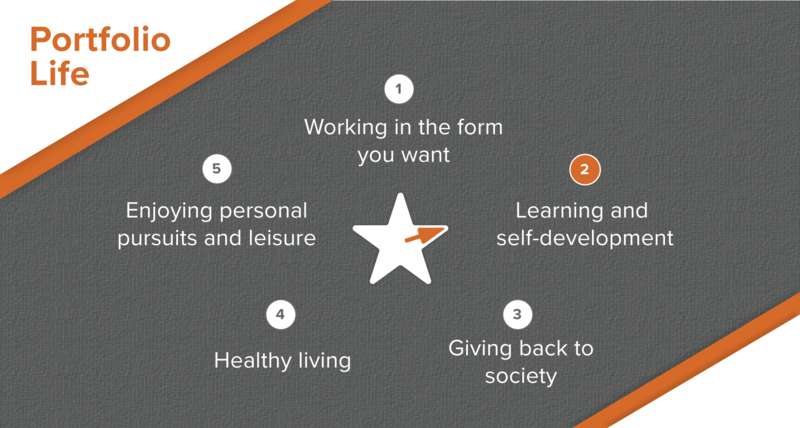 This month is part two of a six part series about life and work after age sixty. This series is for those who want to create a thoughtfully crafted future that is best described as a portfolio life. 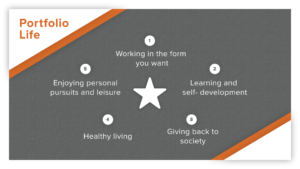 The five elements of a portfolio life include working in the form you want, learning and self-development, giving back, healthy living, and enjoying personal pursuits and leisure. Jack was an exceptional mechanical and electrical engineer. He was also a pioneer in the computer industry. Over his career, Jack worked in both large and small manufacturing businesses. He preferred the more nimble, less political, small businesses during the second half of his career. By his mid 50’s, Jack had risen to Vice President of Engineering at Ramsey Engineering, a small manufacturing business in St. Paul, Minnesota. Jack once shared with me that being a Vice President was not as satisfying, or as good a fit, as his previous roles in engineering. He had worked very hard to earn that Vice President title, was highly compensated, and a loyal and productive leader. Ramsey Engineering was a very successful company, but shortly after Jack turned 57, the company experienced a deep revenue drop. Some personnel changes were needed to cut costs, and Jack with his high salary was a target. There was a good chance that Jack’s job was going to be eliminated, and he needed to do some quick thinking to avoid that fate. The proposal Jack made to the board during this difficult period was brilliant. Jack told the board, “I’ll shift my title to engineer and project manager, and work half time, thus cutting my salary in half. I will return to engineering and help solve the toughest customer problems at Ramsey.” Jack’s proposal was accepted by the board, thus beginning a ten year period that turned into Jack’s most satisfying and productive of his career. In the first five years in his new role, senior managers would smile and say, “We got a great deal with Jack. We pay him as a half time employee, but we know he thinks about the company all the time.” That observation was true the first five years, because Jack needed to spend considerable time getting back up to speed as an engineer. In his last five years, however, between age 62 and 67, Jack was able to hold true to his half time work schedule. He was bridging to retirement by taking on volunteer roles and adding more travel and leisure to the other half of his schedule. Jack often described these last ten professional years as, “My perfect bridge to retirement.” He lived to age 99. In his early 90s, Jack was still very productive in his volunteer work for the Service Core of Retired Executives (SCORE) two days a week, and reading for the blind two mornings a week. Needless to say, Jack is an inspirational role model! My father was a sales representative for Deluxe Check Printers (now Deluxe Corporation) for 38 years. He loved his job and was dearly loved by his co-workers and customers. George retained the coveted Twin Cities sales territory for all those years. When he turned 65, George was told that he had to retire in order to move younger, ambitious, sales reps into his highly attractive territory. He was devastated. My father did not want to retire, but was given no choice. When George became progressively bored and restless at home during his first six months of retirement, he realized he had to turn off the TV and get out of the house. He started to visit his former customers at the banks. George asked about how Deluxe was treating the bankers and tellers after his departure? They had positive things to say about Deluxe, but also told George about a competitor of Deluxe who was offering bank forms at a very good price. George was intrigued. He asked about the quality of the products and the competitor’s sales rep. The response was, “The price and quality are great, but the sales rep is the owner, and he is no George Dow.” They wanted their good friend George back, and perhaps this could be a way to make that happen. If he was employed by the new bank form company, George could once again make the bankers and tellers smile, laugh, and buy from him, as they had happily done for 38 years. I am very lucky to have had Jack and George show me by example how to work in the form I want after age 60. Now you, too, have their stories to guide and inspire you as you piece together your future life and work. Next month I will continue this blog series with the second element of a portfolio life…learning and self-development. Until then, happy trails to you. This month begins a six part series about life and work after age sixty. This series is for those who want to create a thoughtfully crafted future that is best described as a portfolio life. The five elements of a portfolio life include working in the form you want, learning and self-development, giving back, healthy living, and enjoying personal pursuits and leisure. Over the past thirty years in my career transition practice, most of my clients in their 40s, 50s and 60s have been very interested in one day living a portfolio life. Many have already done so successfully. In this blog I will describe this life and ask you, as I have asked each of my clients, “When the time is right, is this how you would like to live in the second half of your life?” I am betting you will. Irish economist Charles Handy coined the phrase “portfolio life” in his 1989 book, The Age of Unreason. Handy describes this life as “A portfolio of activities – some we do for money, some for interest, some for pleasure, some for a cause…the different bits fit together to form a balanced whole…greater than the parts.” I will get to this second half of life destination in a minute, but first let’s take a look at what precedes it. In our first twenty-five years, the majority of our time is spent learning in school, on the playground, in our families and neighborhoods, and in the organizations we occupy. We learn how to do what we need and want to do, and how to navigate our world. In this phase, in addition to our personal and community commitments, most of us choose to establish ourselves in our paid work. We spend more time at this than all other areas of our lives, and want to establish ourselves as competent and successful. If we are highly ambitious in our careers, over 70% of our time and energy will be invested in our paid work. The earning years usually continue without much change early in this period, but over time, can take on many forms. For most of us, getting out of the workforce altogether is not economically feasible or wise until sometime in our 60s. Economics editor Chris Farrell’s book Unretirement makes a strong financial, personal and societal impact case for working longer and retiring later. It is difficult to leave your career early, not only because of financial needs and longer life expectancy, but also because our identity, social circles and sense of purpose are tied closely to our working role and organization. Letting go of a significant job without a predictable alternative income source or a compelling new work identity, can be very difficult. Proceed with caution, but start exploring options before the big changes take place. Start building your bridge now before you need it. Understanding the many ways you can work in the form you want in the second half can ease the disruption of leaving your job and can include a wide range of options. There include using your existing skills in a new environment, pursuing new terms of employment (like consulting, contracting, part-time or interim assignments), starting a new venture, downshifting to a lower level role, new work altogether, or a plan to bridge from one of these options to another over time. You have many more choices than you might realize. To learn more about these options, read my 2018 blog series. Each of nine distinct career alternatives is described, along with financial implications, degree of difficulty, success strategies and case studies. Keep an open mind, experiment a little, and have some conversations with people who have already pursued these new avenues. You might be surprised by what you discover! Over time, as earning a full-time wage becomes less of a primary driver, other aspects of our lives grow in importance. More time is available to broaden and enrich our lives. The five part portfolio life model is described in the writings of David Corbett, author of, Portfolio Life, the New Path To Work, Purpose and Passion after 50. I highly recommend this book to executives and professionals considering a portfolio life. In the early stages, the learning and self-development elements of a portfolio life might still have a professional focus. On the other hand, when the time is right, you might prefer to do something altogether different from what has been your professional focus. If so, consider programs within universities, community education, and other learning options such as Road Scholar (previously Elderhostel). Start thinking of yourself as a college freshman, but this time you don’t need to choose a practical major. Is it time to experience liberal arts learning with this liberating twist? Is there something you have been hoping to learn and/or develop, but you haven’t had the time? Is it time now? Giving back to society becomes a growing focus of a portfolio life. More of your time, talent and resources can now be directed towards the programs you care about. What has worked for you in the past, and what hasn’t? Sit down with someone who has set a good example of being generous in this way and has similar community interests and values to yours. Discuss your options and ask their advice on how to find a path that might fit you. Who needs you now? What cause do you want to serve that will energize you? Healthy living includes several personal aspects of a portfolio life, such as mind, body and spiritual work, strengthening relationships with family and friends, and managing your finances. Is it time for that fitness class? That bike ride? Are you satisfied with your financial health? What are you reading these days? How are you taking care of yourself? Do you have a spiritual practice? There are many good resources and people out there to tap for ideas. It is time to take stock and begin those conversations about your health, finances, relationships and overall well being. There are many personal and leisure pursuits that will bring us satisfaction in our portfolio years, but if you are still reading this blog, It is likely you appreciate the value of all five portfolio life elements. You aren’t exclusively pursuing “carefree content” living in your second half. Personal pursuits and leisure are not enough to sustain you, but they are important. What are the activities that you enjoy? Is a portfolio life the story you would like to write in your second half? It may take a while before you can jump off the full-time job track and fully embrace a portfolio life, but I think you will agree that this is a very appealing choice. Perhaps your portfolio life will include some version of the five part model I have described in this blog. You will learn about each of these five elements in the coming months, with case studies and guidance to help you shape your path forward. Even if a portfolio life is a ways off for you, it’s not too early to start building a bridge to it. Perhaps it is time to start letting go of some work related activities. You might also want to start adding other elements you haven’t attended to recently, or which your work has displaced. We are always moving towards a new life stage. Good luck as you start your next chapter.